Monologue Caps SSi font family series mainly provide Small Caps,Italic Small Caps,Bold Small Caps,Bold Italic Small Caps and other font styles. Safari Bold Small Caps font family series mainly provide Bold Small Caps and other font styles. Access Caps font family series mainly provide Caps,Caps Bold and other font styles. Yana font family series mainly provide Swash Caps II Regular,Swash Caps II Italic,Swash Caps II Bold,Swash Caps I Regular,Swash Caps I Italic,Swash Caps I Bold,Regular,Italic,Bold and other font styles. SheriffCaps font family series mainly provide RomanCaps,RomanBoldCaps,Roman,ItalianBoldCaps,Bold Italic,Bold and other font styles. 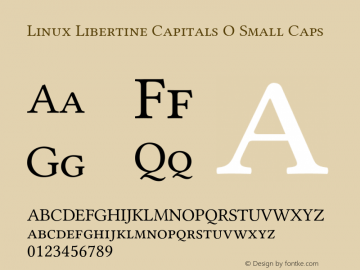 Linux Libertine Capitals O font family series mainly provide Bold Italic Samll Caps,Small Caps,Semibold Small Caps,Semibold Italic Samll Caps,Italic,Bold Small Caps and other font styles. Apex Serif Bold Caps font family series mainly provide BoldCaps,Regular and other font styles.